If you are looking for a unique engagement ring, pearls are worth considering. The symbolism of a pearl ring can be very meaningful to couples looking for a unique and timeless option that is a symbol of harmony, perfection and purity. Solitaire: This classic style uses a single pearl as the center stone and can be set in any type of metal from sterling silver to gold. An example of this ring is the Solitaire Collection Akoya Pearl Ring, a simple yet elegant ring done in your choice of yellow or white 14K gold. The center stone is a white Akoya pearl that is lustrous and stunning. Accented: One of the most popular styles is a central pearl accented on each side by diamonds or other stones. 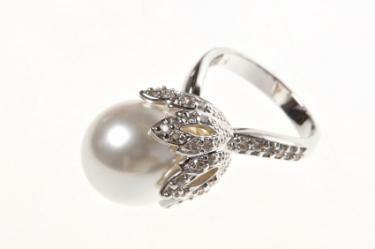 This Freshwater Pearl and Diamond Ring is an example of this design. Set in 14K white gold, it features a cultured pearl and is accented with diamonds. Halo: A center pearl is the star of this style of ring. A circle of diamonds or other stones is used to surround the center and accent the stone. This 14k Gold Pearl Halo Engagement Ring is a simple, lovely halo style. Cluster: Instead of a single pearl, a cluster of small pearls is used to create the center. This is a less-traditional ring design and rings of this type may not be labeled as engagement rings. 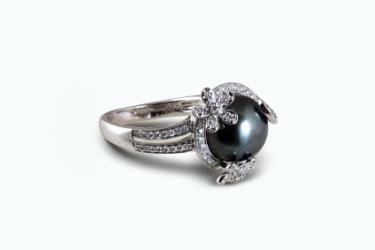 The Cultured Freshwater Pearl and Diamond Cluster Ring is a stunning example. Eternity: Small pearls, like the ones on this 14K yellow gold Cultured Pearl Eternity Ring, are set into a band that wraps the entire finger. Engagement rings with pearls can also be done in designs such as flowers or hearts. Diamond accents are almost always used to add to the intricacy of the ring and to create more detail in the design. Freshwater Pearl and Diamond Ring: This ring features a freshwater cultured pearl as the center stone and features channel-set diamonds in the band. Yellow Gold Cultured Pearl Engagement Ring: Done in 14K yellow gold, this ring has a large cultured pearl center nestled between two round full-cut diamond accents. Black Pearl AA Diamond Ring: This 14K white goldring features a black pearl in its center with a small diamond on either side of it. Flower CZ Pearl and Diamond Engagement Ring: This ring features a lustrous 8mm pearl framed by two flowers made of CZ diamonds. It is set in a rhodium-plated metal. Pearl Desire Ring: Done in sterling silver and featuring a freshwater pearl center, this ring is accented by two white cubic zirconias. CZ Pave Tahitian Shell Pearl Cocktail Ring: This ring features a large Tahitian black pearl in the center, set with CZ diamonds in rows down each side. Shecy Pearl Jewelry carries a selection of engagement rings with pearls. All rings come with a free Certificate Appraisal completed by a GIA graduated gemologist. White Cultured Freshwater Pearl Ring: Done in 18K white gold with a freshwater pearl center and cubic zirconia accents, this ring is an elegant choice for any bride-to-be. Golden Cultured South Sea Pearl Ring: Set in yellow gold, this ring feature a golden cultured South Sea pearl center and a small band of CZ accents. Black Cultured Akoya Pearl Ring: This gold ring features a black Akoya pearl in the center with tiny diamonds set on either side. It can be set in either 18K white or yellow gold. Cultured: Unlike pearls that form naturally, cultured are made by placing shell beads or other irritants inside a small cut in an oyster or mussel, triggering the mollusks to begin covering the offending intruder with nacre to influence pearl cultivation. Cultured and natural pearls are considered equal quality, but cultured pearls are typically less expensive because they are more common. Saltwater: Saltwater pearls are usually more expensive than freshwater pearls. Some of the most sought after and valuable saltwater pearls are the Akoya Japanese pearls and the Tahitian pearls. Freshwater: Freshwater pearls are found within the mussels of lakes and rivers in many countries, including the United States. 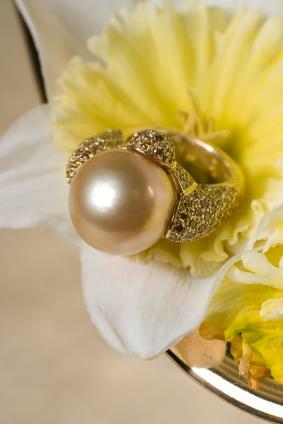 When looking at pearl rings, you will want to make sure that the pearl is not cracked and has a glowing luster. To check the authenticity of a pearl, simply rub it against your tooth. If the surface feels rough, then it is pure and authentic. Artificial pearls will feel smooth against your tooth. Shape, color and size of pearls are important for engagement ring shopping. Pearls actually come in a variety of shapes, ranging from round to tear-dropped. 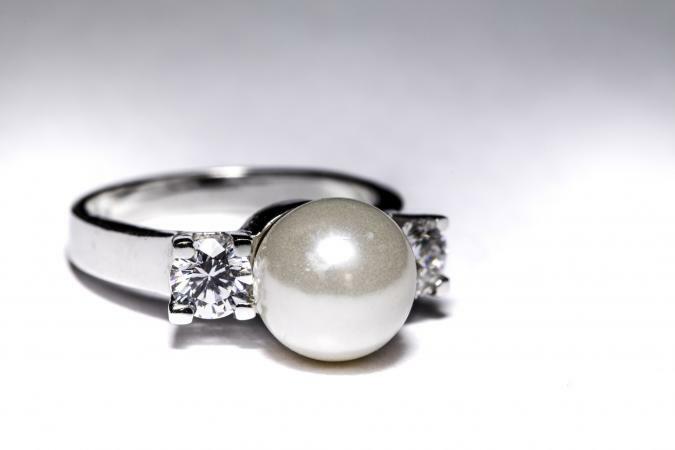 A perfectly round pearl is considered the most valuable shape and is often used in more expensive pearl rings. Many pearls actually have a main color with a second shade as an overtone or highlight. The combination of these colors influences the value given to a particular stone. Pearls are delicate and require extra care when worn daily to avoid scratches or loosening of a stone. It is not the best engagement ring choice for someone with an extremely active lifestyle who needs a ring that can take a lot of rough handling. This type of ring should be removed whenever doing any type of chore involving chemicals or any activity, like a sport, that may be harsh on the hands. Whenever the ring is not in use, it should be stored separately in a satin jewelry pouch away from other jewelry to prevent scratching. Only use a soft cloth to clean the gemstone and take it to a jeweler regularly to make sure the setting is secure. While pearls are less expensive than diamonds, some pearl rings can can actually be more expensive than a traditional diamond ring. A pearl ring can be more difficult to set than a more durable mineral gem, and many pearl rings also feature accent gemstones, including diamonds. As with any piece of jewelry, the final cost is determined by many factors, including the quality of the gem, the design of the setting, value of the metal, and any other desired customization. You may be surprised with the great prices that can be found for a stunning pearl ring. The Romans believed pearls were associated with the moon and was a source of power. Early Christians viewed pearls as symbols of purity and innocence. In Medieval Europe, only people of certain social rank could wear pearls because of their value. Many ancient cultures used pearls as their crown jewels. Since pearls were one of the most prized gems, they were also a popular choice for engagement and wedding jewelry up until the 19th century in both Europe and America. Early engagement rings were betrothal rings. European betrothal rings in the Renaissance period through the Victorian era often incorporated pearls. Betrothal rings during the Medieval and Renaissance eras were sometimes quite lavish. Some Renaissance Jewish engagement rings were miniature sculptures in their elaborate designs and pearls were common gemstones in arrangements. Many brides wear pearls on their wedding day, and a pearl ring is an elegant nod to that tradition as well as a unique choice for an engagement ring. Whether cultured or natural, simple or enhanced, a pearl ring is a simple and elegant symbol of a couple's enduring love.